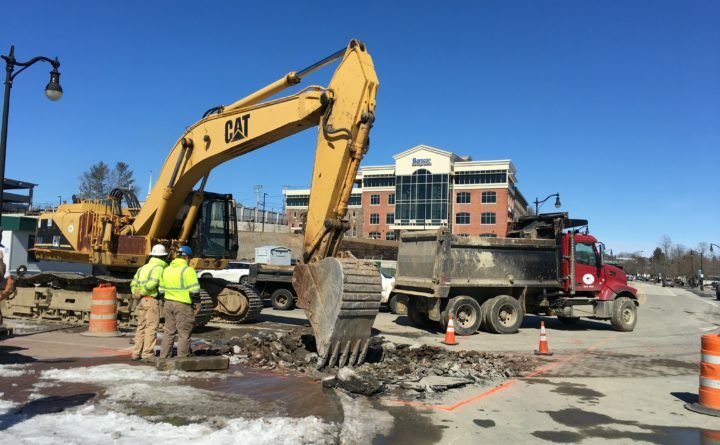 Workers on March 18 dug near the intersection of Railroad and Front streets in Bangor as part of a project to replace the sewer pipes that flow down toward the Penobscot River, with the goal of reducing the sewage that overflows into the river. Bangor officials hope that a yearslong set of construction projects now starting along the city’s waterfront will cut the amount of raw sewage that flows into the Penobscot River during periods of heavy rain and snowmelt, as required by a 2015 consent decree with the U.S. Environmental Protection Agency. 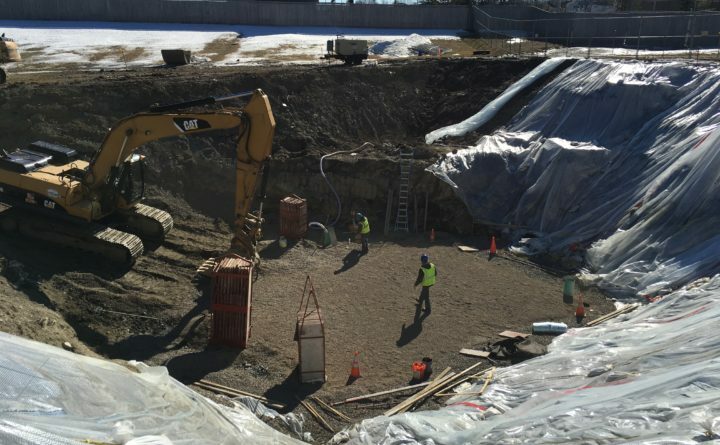 As part of the first leg of the project, workers dug a large hole in the grassy area between the new Bangor Savings Bank campus and Darling’s Waterfront Pavilion on Main Street. That area follows along Railroad Street and regularly hosts a portion of the American Folk Festival each summer. For the rest of spring, S.E. MacMillan Co. will be replacing pipes and a piece of equipment known as a sewage regulator in that area, according to City Engineer John Theriault. That will improve the system’s capacity for directing sewage from there to the city’s wastewater treatment plant, located about a mile down the river. The contractor currently plans to halt the project around the start of June — to allow the Waterfront Concerns series, American Folk Festival and other activities to take place — before resuming in September and finishing by the end of 2019, Theriault said. It will cost $2.55 million and is being funded with revolving, low-interest loans from the state. It’s just one part of a much larger set of changes that Bangor plans to make over the next decade to follow the 2015 consent decree with the federal government, which requires the city to make an estimated $62.9 million worth of infrastructure changes by 2031. The overall goal of the improvements is to decrease the amount of sewage that flows into the river when the city’s stormwater system is overloaded by rainfall and snowmelt. Future steps include the installation of three new storage tanks and new sewer and stormwater lines in several sections of the city. Next fall, the city hopes to begin installing one of the tanks along the city waterfront in the area behind Tim Hortons on Main Street. The 3.8-million gallon tank would be buried underground at an estimated cost of $20 million, according to Theriault. That project, which the city hopes to put out to bid in July, will take an estimated two years to complete, Theriault said. Unlike the changes along Railroad Street, they will not pause during the summer even though the American Folk Festival also extends into that part of the waterfront. Heather McCarthy, executive director of the American Folk Festival, said it’s too soon to know how the upcoming work will affect the event. “At this point, we are still in the process of determining exactly what impact this project will have on this year’s Festival,” McCarthy said. She also praised city officials for being “very open and willing to discuss the work being done, the timeline, and what to expect” and said the festival has had “a great working relationship” with the city. When the work that recently started on the waterfront pauses over the summer, Theriault said, the contractor may need to lay crushed stone or pavement so that the American Folk Festival can use the space. The city previously spent $42.8 million on projects to stop combined sewer overflows between 1987 and 2008, reducing its annual wastewater overflow to about 40 million gallons annually. But in 2015, the city agreed that sewer overflows were still causing water quality violations, leading to the consent agreement with the EPA. The city has recently been experiencing about 21 combined sewer overflow events a year, but officials hope the coming improvements will drop that number to four. The work will also include the installation of a 3.6-million gallon storage tank in Bass Park and a 1.1-million gallon tank next to the Kenduskeag Pump Station at Washington Street, according to plans on the city’s website. Those two projects are estimated to cost around $30 million.